We use recent lattice data on the gluon and ghost propagators, as well as the Kugo-Ojima function, in order to extract the non-perturbative behavior of two particular definitions of the QCD effective charge, one based on the pinch technique construction, and one obtained from the standard ghost-gluon vertex. The construction relies crucially on the definition of two dimensionful quantities, which are invariant under the renormalization group, and are built out of very particular combinations of the aforementioned Green’s functions. The main non-perturbative feature of both effective charges, encoded in the infrared finiteness of the gluon propagator and ghost dressing function used in their definition, is the freezing at a common finite (non-vanishing) value, in agreement with a plethora of theoretical and phenomenological expectations. We discuss the sizable discrepancy between the freezing values obtained from the present lattice analysis and the corresponding estimates derived from several phenomenological studies, and attribute its origin to the difference in the gauges employed. A particular toy calculation suggests that the modifications induced to the non-perturbative gluon propagator by the gauge choice may indeed account for the observed deviation of the freezing values. A. Cucchieri and T. Mendes, What’s up with IR gluon and ghost propagators in Landau gauge? A puzzling answer from huge lattices, PoS(LATTICE 2007)297 [arXiv:0710.0412] [SPIRES]. I.L. Bogolubsky, E.M. Ilgenfritz, M. Muller-Preussker and A. Sternbeck, The Landau gauge gluon and ghost propagators in 4D SU(3) gluodynamics in large lattice volumes, PoS(LATTICE 2007)290 [arXiv:0710.1968] [SPIRES]. O. Oliveira and P.J. Silva, The lattice infrared Landau gauge gluon propagator: the infinite volume limit, arXiv:0910.2897 [SPIRES]. O. Oliveira and P.J. Silva, The lattice infrared Landau gauge gluon propagator: from finite volume to the infinite volume, arXiv:0911.1643 [SPIRES]. O. Oliveira and P. Bicudo, Running Gluon Mass from Landau Gauge Lattice QCD Propagator, arXiv:1002.4151 [SPIRES]. T. Kugo, The universal renormalization factors Z(1)/Z(3) and color confinement condition in non-Abelian gauge theory, hep-th/9511033 [SPIRES]. 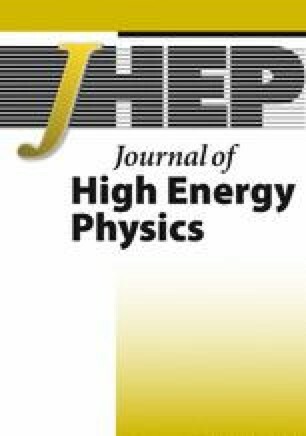 A. Sternbeck, The infrared behavior of lattice QCD Green’s functions, hep-lat/0609016 [SPIRES]. E.M. Ilgenfritz, M. Muller-Preussker, A. Sternbeck and A. Schiller, Gauge-variant propagators and the running coupling from lattice QCD, hep-lat/0601027 [SPIRES]. Open Access This article is distributed under the terms of the Creative Commons Attribution License which permits any use, distribution and reproduction in any medium, provided the original author(s) and source are credited.